After spending the week studying and writing my exam yesterday afternoon I really wanted to enjoy today. I still have a busy couple of weeks before I take some time to go visit my family, celebrate my birthday and lounge by the pool (I’m keeping my fingers crossed for nice weather). As wonderful as it would be, I know I am unable to spend today doing absolutely nothing. I am determined to make some time to work on a couple of future blog posts and do some writing and possibly editing. I did manage to accomplish one thing this morning – I finally got around to cleaning my make up brushes! I have three methods that I typically alternate between when I clean my make up brushes. Of the three, this method is probably the least expensive and the easiest. Step 1: Fill a mug or glass approximately half way with hot water. Step 3: Soak your make up brushes in the water and vinegar mixture for 20-30 minutes. Step 4: Rinse each brush with hot water. Step 5: Rinse each brush with cool water. 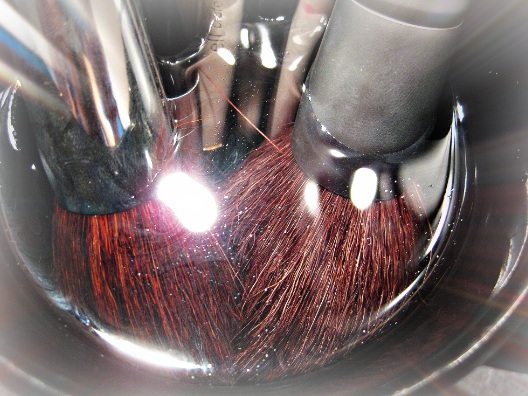 Step 6: Pat each brush dry to remove any excess water. Step 7: Air dry. I lay my brushes on a clean hand towel while they air dry. This method is quite common when it comes to cleaning make up brushes. I will be posting the other two methods I use when cleaning make up brushes in the future. With this method, you may need to adjust the length of time you allow your brushes to soak. I have soaked mine for up to four hours before. Once because I forgot about them and another time because they were stained blue after I did my make up for a Halloween party. I am off to find a balance between relaxation and productivity. Be sure to let me know if you have any suggestions or requests for future blog posts. This entry was posted on August 2, 2013, 12:21 pm and is filed under Tips & Tricks. You can follow any responses to this entry through RSS 2.0. You can leave a response, or trackback from your own site.